Chucking an indicator all day with a big stonefly nymph is a very effective way to catch large amounts of fish fairly easily. Although nymphing is still a lot of fun, it’s hard to beat the feeling of a tight line streamer grab. Whether swinging or stripping, the art of getting a large picky fish to eat a big sculpin is what keeps me up at night. This post is meant to give a basic intro in to what goes in to fishing and designing your own sculpin patterns. If you have any questions when your done, feel free to contact us! We love chucking big streamers for big fish! Profile – Think big head, flared out pectoral fins, and a quickly tapered tail. Eye’s aren’t always necessary but can be a bit more effective on fish that will key in on bait-fish, especially coastal cutthroat in the Puget Sound, or big brown trout. Just remember to think about how your fly is going to look in the water. Materials like rabbit strips will slim down a bit and have lot's of movement, while still holding a tapered shape for a natural looking tail. Size: I change fly size based on the time of year, and species I’m fishing for. Early in the spring and throughout the winter when water is colder and fish are lazier, I stick to smaller, heavy flies that look injured for a simple meal. If I’m fishing in the late summer and fall, the small sculpins will still catch fish, but throwing something big and aggressive that a larger fish might want to chase and kill is hard to beat. Color: Dark day, dark fly, bright day, bright fly is a great rule to stick by. If water is dirty, stick to solid colors and a bit of flash to help create more contrast with the water. I prefer a solid black, or a solid white when visibility is low. If the water is clear, then a light olive or natural brown/tan colors will do just fine. Just remember, if all else fails then a black fly swung deep is going to be seen. It will cause the most contrast with the water and the bottom and if it has a sculpin-ish profile then it could get some big fish stirred up. What should I look for as far as water? Structure: Always remember that fish will always hang out where there is structure. Structure can mean anything from logs and rocks, to steep drop offs and high cute banks. These are places where fish will feel much safer from predators and congregate to wait for food to drift by. Swinging a sculpin in to a steep bank, log jam, or over a drop off are your best bet to find fish throughout the year. Seams: Where fast water meets slow water is typically referred to as a seam. This could be where fast current meets a slow deep eddy or the current behind logs and boulders. These are great areas to target with a nymph and indicator, but big fish will also look for bait-fish that are too weak to swim in the fast current, and have swept in to the slower holding water. A great indicator of a seam is where you see bubble lines. How do I fish a sculpin? Swinging: In wide deep runs with a lot of structure, swinging sculpins is a great way to cover water and find big fish. Whether with trout spey or just a single hand line, sink tips are necessary for presenting flies to fish correctly. 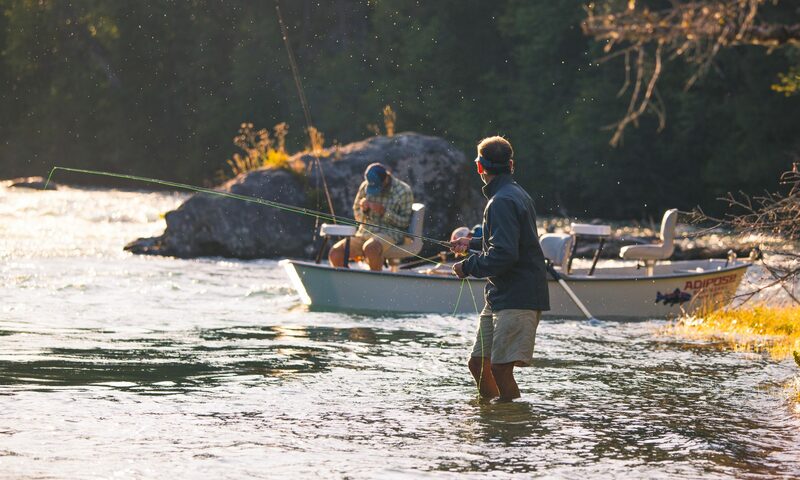 Casting upstream and throwing a big mend before starting your swing is a great way to allow your fly to sink down to fish. Swinging works best in runs where the bottom is uneven with a large variation of rock sizes and scattered boulders or logs. Don’t try to swing runs with only gravel or sand bottoms unless there’s good buckets or drop-offs that can fish hold in. Remember, it's all about structure. Stripping: Stripping sculpins is best done from a boat. This way you can cast back to shore and strip back to the boat allowing you to cover as much water as possible. Cast in to deep eddy’s, steep cut banks, boulder gardens, and log jams. This works best with a single hand line with a sink tip to get the fly down to where you want it. If you don’t have access to a boat, you’ll be fine. Just keep the same mentality of casting in to boulders and logs or casting in the eddy’s. Nymphing: Yes, you can nymph a sculpin. A heavy sculpin under an indicator can be extremely effective for covering a lot of water and finding some big fish. Where fish sit behind boulders or big stumps, try high sticking without an indicator. A lot of times you can watch the fish eat, but just watch the end of your fly line and set the hook on anything that seems out if the ordinary.